Valentine's Day will be here soon. 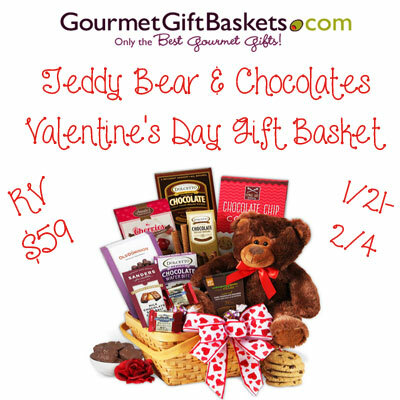 This basket would be an awesome gift for the one you love! This is an awesome giveaway! I'm not too big on Valentine's Day but I'll take a basket of chocolate! A single rose was the best present! Time--a home cooked dinner and "whatever you feel like doing tonight." Gorgeous red roses were my best Valentine's Day gift. My daughter who was born around Valentine's Day. A real pretty homemade Valentine card from my kids filled with all kinds of decorations. I got an adorable teddy bear from my Mother one year after a boyfriend had decided it was a good time to breakup. Reminding me that a Mother's love is unconditional. A very simple emerald solitaire ring, still one of my favorites. A handmade rose was a memorable gift. Homemade cards from my two children and a box of candy from them and my husband. Handmade card from my Grandmother. An angel table from my husband. A beautiful pale yellow (my favorite) plant. My husband bought me a beautiful, expensive watch years ago. It was so memorable because we really didn't have the money but he had saved for a long time to get it for me. The year my hubby finally got me a dozen red roses was the best! I don't know about memorable since I don't remember much these days but I will take chocolate any day. My husband rented a romantic cabin for the weekend. A beautiful antique ring from my husband. My boyfriend gave me a sweet personalized book for Valentine's Day. My husband got me a puppy for Valentine's Day one year. Red roses were a memorable Valentine's Day gift. The only thing I have ever received was roses, and I love flowers! My most memorable Valentine gift was a handmade card from my Granddaughter. It is the little things that matter. Best gift was a handmade metal sign with mine and my husbands name together with a heart. I am happy with handmade gifts from my kids.